I like the sound of that. Amidst all the hustle and bustle surrounding recent events with the Louisville Orchestra and Kentucky Opera (which likely won’t have an orchestra for their next production) and with the Louisville Bach Society‘s finally closing shop this past May, things are looking grim for large scale music/arts organizations. But this isn’t going to be a post about the doom and gloom locally, but one about something I’ve been thinking about for some time: a large scale non-Western organization. I don’t know if I would want to end up calling this an “Arabic Orchestra” and solely focusing on art music from that region, but it’s a placeholder for now. What Id ideally like to see is a truly international ensemble which focuses on art musics from all around the world. Similar to the Vancouver Intercultural Orchestra or the MESTO Orchestra I’ve talked about in past posts (though on an even bigger scale). 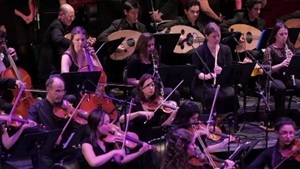 An Arabic Orchestra seems natural given most of my association with folks throughout the US who are interested in music from that part of the world but also because of how quickly ensembles like this are growing and emerging throughout the US. But mostly because I’ve recently tapped into a local population of musicians who might be able to populate such a group. Sadly, organizations like the League of American Orchestras and the infrastructure of the arts in the US is generally Eurocentric (for good and ill) which makes almost all such endeavors rely on very local and grassroots level. But seeing how much the Michigan Arab Orchestra and the New York Arabic Orchestra have expanded their reach and/or shifted their operational models on how the typically Eurocentric ensembles work, it is encouraging to see that some of that infrastructure can also be useful. Of course, a full scale orchestra is a discussion for later. Right now I and some of my cohorts in Ahel El Nagam want to get a regular Middle Eastern music meetup going where we can start to draw in the local musicians who already play in these traditions or just musicians that would love to learn more about it. While this picks up I will be sorting through different logistic/economic factors and talking and reseraching A LOT with the folks who are currently running ensembles/orchestras like this in the US (e.g. Bassam Saba, Michael Ibrahim, George Boolos, Scott Marcus, Ali Jihad Racy) or educational resources for this music, and connecting with the more local/regional talent (e.g. Members of Salaam in Bloomington, IN; George Wakim in Lexington, KY) in ways so that we can maximize potential. Until then, all I can do is watch what is happening here and help how little I can with the resources I do have.